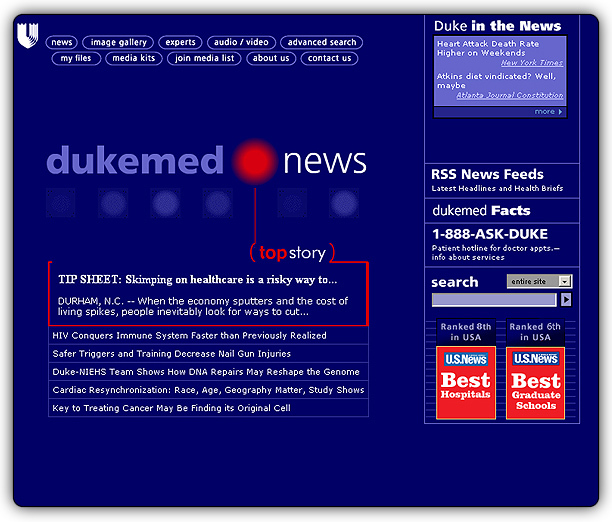 DukeMedNews is the central news portal for Duke Health System’s world-class medical center. The site provided the latest press releases and information resources to news reporters across the globe. IONA was selected as the development and project management team for the redesign and retooling of a first-generation site. After review of Duke’s web technologies, IONA provided a solution using HTML, PHP, and Flash for the front end user interface and the content management system. The site housed news articles and updated daily. 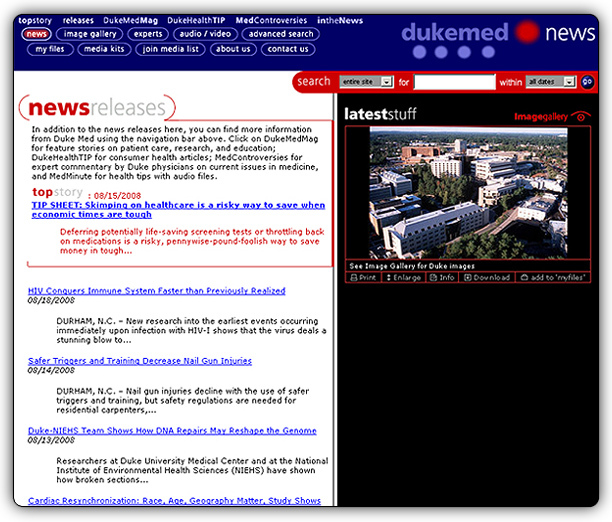 The site provided audio and video files, news articles, and web and print quality images allowing reporters to instantly obtain the latest news and resources from Duke. ways that made the content more convenient and usable for the DukeNews audience. DukeNews information was compiled within the system infrastructure with the intent to scale and search the information easily. Features that could be customized and modified through the CMS included…. Stories, personal profiles, audio, images, and videos compiled within the system and displayed in six different user environments including: general news and “audience specific” news categories. Each article and audio news linked to multiple images in high (print) and low (web) resolution. Relational Content Management: All media in the system was connected for the purpose of providing related information on all pages of the site. Each article and media item utilizes three attributes for the relational comparison. 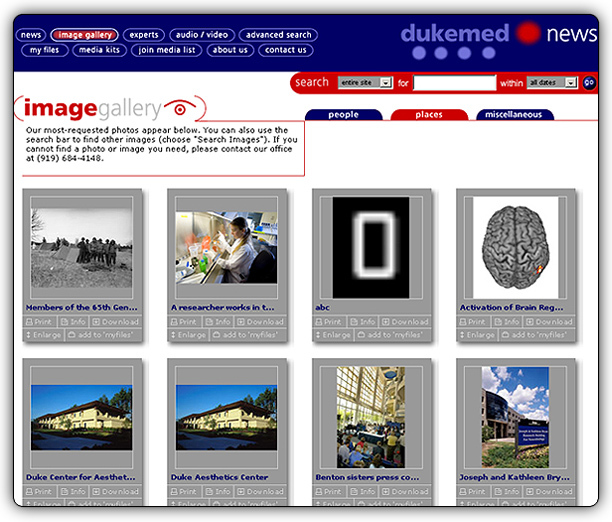 Receiving positive publicity after its launch, DukeMedNews become an award-winning interactive solution recognized by the American Medical Association for the most innovative digital environment.